Pictures like this speak to me. Obviously, I was drawn to it and stopped to read the caption and comments. Cue screeching record sound… What?! I’m sorry… but that is ridiculous. Why do you have to do a ridiculously long and strenuous workout in order to justify eating a cheeseburger and fries? Why do you have to burn a million calories in order to enjoy it? Or, make a vow to run a million miles the next day? Why can’t you just eat it and say, “man, that was delicious,” without feeling guilty? Now, don’t misunderstand me. I am in no way saying that you should go out and only eat cheeseburgers and fries (or whatever your guilty pleasure of choice may be), obviously. Not at all… but if you eat well most of the time, and yes, if you do ridiculously long and strenuous workouts more often than not (as this person does), then what the heck? Eat a damn cheeseburger! Occasionally enjoying an “unhealthy” meal is not going to “ruin all of your hard work,” and it’s not going to make you gain 20 pounds or ruin your diet/workout regimen. Depending on the burger and your digestive system, you may be a bit bloated or gassy after…but it’s not going to ruin your overall health plan. It’s about balance, people! I guess what I found most disturbing was the user who posted this picture. You are a role model in a healthy living community. That is not a healthy state of mind…and it’s a common theme I am finding as I peruse my instagram and twitter feeds of bloggers/people who claim to have a healthy lifestyle…people I look up to! People would rather drink a protein shake or eat an energy bar full of artificial sweeteners and ingredients they can’t pronounce, than enjoy real, whole foods that happen to be calorie dense. I see more protein shakes with a side of celery or a few apple slices than real, balanced meals on my feed. WHY?! When did we get so far away from balance…and eating real food? Again, I am NOT saying that a cheeseburger and fries is “healthy meal,” nor am I saying that all protein shakes/energy bars are bad…not at all! I’m just saying, everything in moderation. Neither of these options is going to completely nourish/sustain a person, especially a highly active person. When you start looking at food as the enemy or depriving yourself…or even trying to justify what you are eating with ridiculously long and strenuous workouts, then there is a problem…and this I am saying from personal experience. On the same note, you also can’t look to food for comfort/stress relief…again, it’s about balance. But, I’ve come to appreciate balance and I’ve finally learned the “everything in moderation” principle…Yes, I watch what I eat…but I don’t completely deprive myself and I don’t freak out after eating a burger. I’m no expert, but I think I’m a lot healthier now because of this. So tell me, what are your thoughts? Cheeseburgers, yes or no? Are you guilty of trying to justify your meals with workouts? Favorite food to drool over on Instagram? Life has been moving pretty fast around these parts lately…I’m looking forward to some much-needed time off and a road trip with Farmer Ben, later this week (Georgia and South Carolina, here we come!). This weekend, I went to a women’s conference with some ladies from my church in Worcester, MA…this was a completely new experience for me and one that I needed. I actually hemmed and hawed about going because, well… I just felt like I wouldn’t have time…but I made time and it was so worth it! 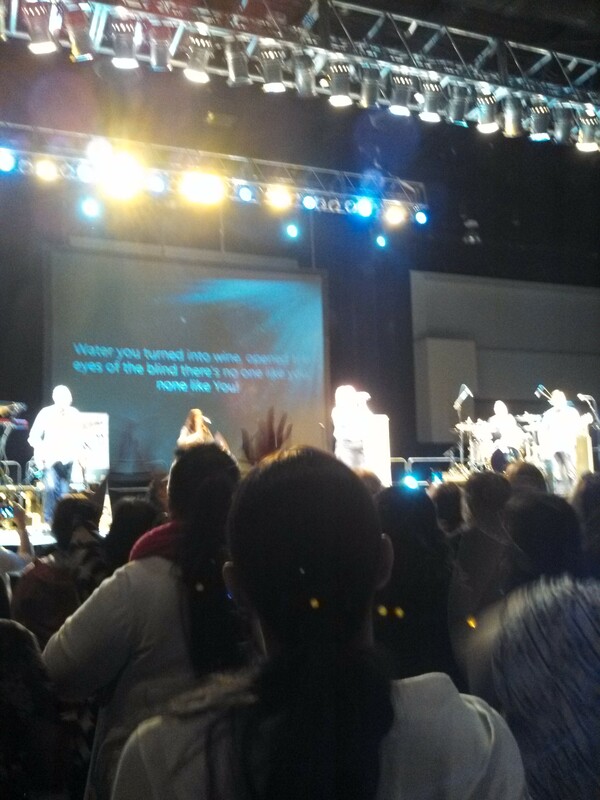 Not only did Natalie Grant lead worship (so powerful! ), but we got to see some great speakers. I learned a lot and came back feeling refreshed and empowered. 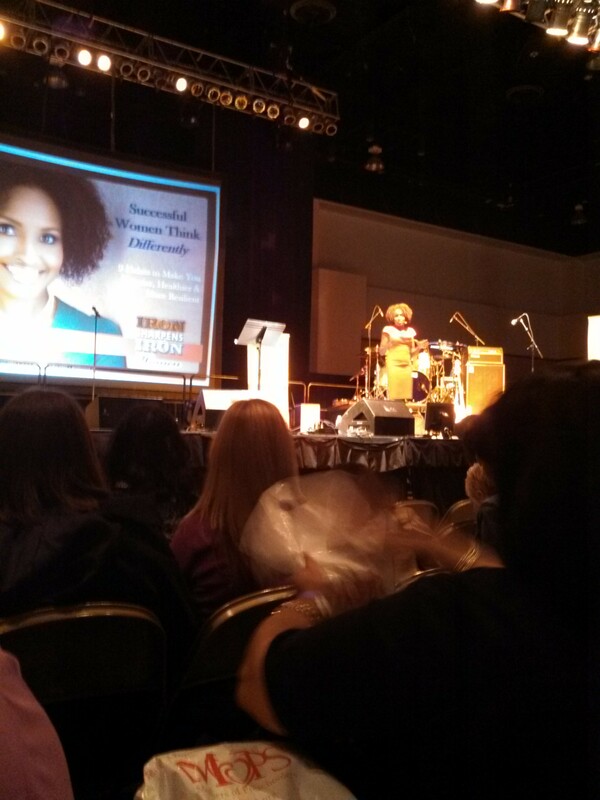 My favorite speaker was definitely Valorie Burton. Valorie Burton…I wish you could see the shoes she had on! I mentioned that this conference was something I needed and I found Valorie’s workshop especially relevant to some things I am dealing with right now. Our group went to a local park and raked leaves…for three hours. By the time we left the park, we had 97 giant bags of leaves and a ton of piles that we just didn’t have the man-power to bag. Needless to say, I am sore today and have some really attractive blisters on my hands. After volunteering we went to my mother’s house and took a quick shopping trip… I don’t know if I’ve mentioned this, but I absolutely despise shopping at Wal-Mart…This shopping trip reminded me why. I think I’ve had my fill of misbehaving, screaming children and rude people for the next three years. We dropped my mom off and then headed to our friends’ house to make a quick dinner. 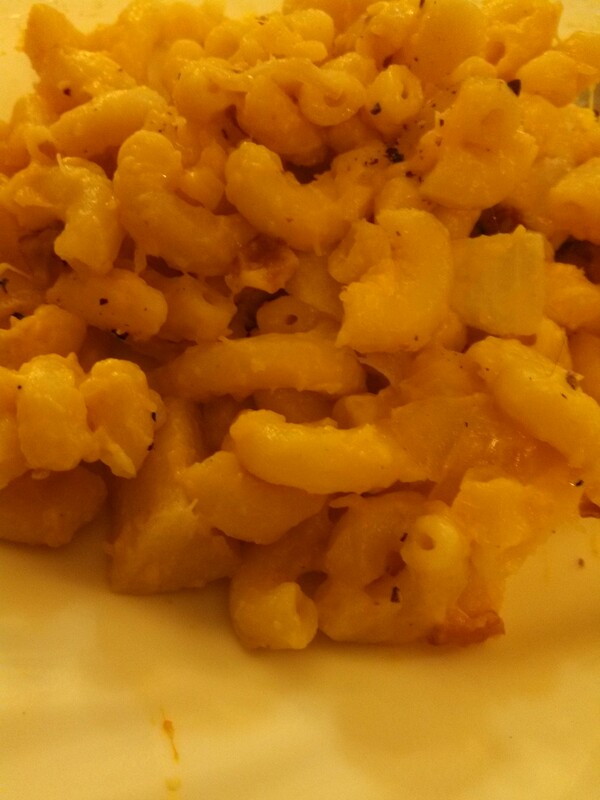 I made this mac & cheese from Pinch of Yum and fooled their son into eating butternut squash. Not only was it delicious, but it only had 1 cup of cheese in a double recipe! After dinner, I whipped up these cookies…they were also a hit. Farmer Ben and I finally made it home at about 9pm and I immediately went to bed. 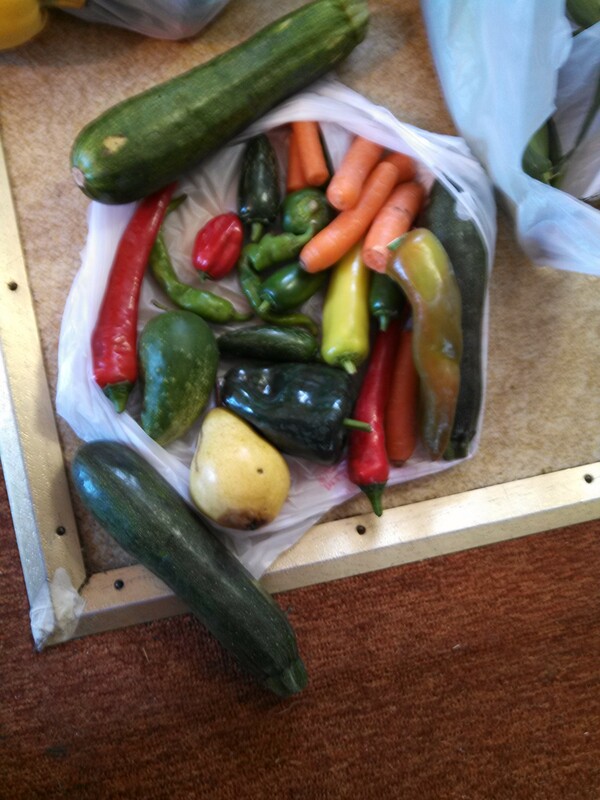 We’ve been going to the market. 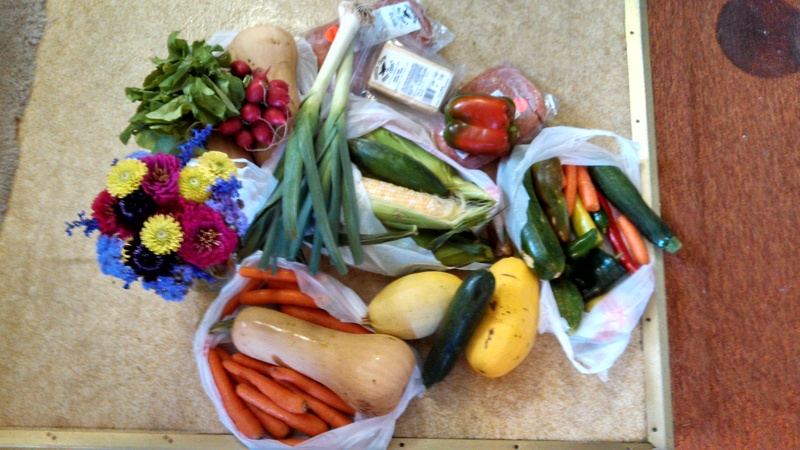 This was $38…$20 for local meat and cheese. 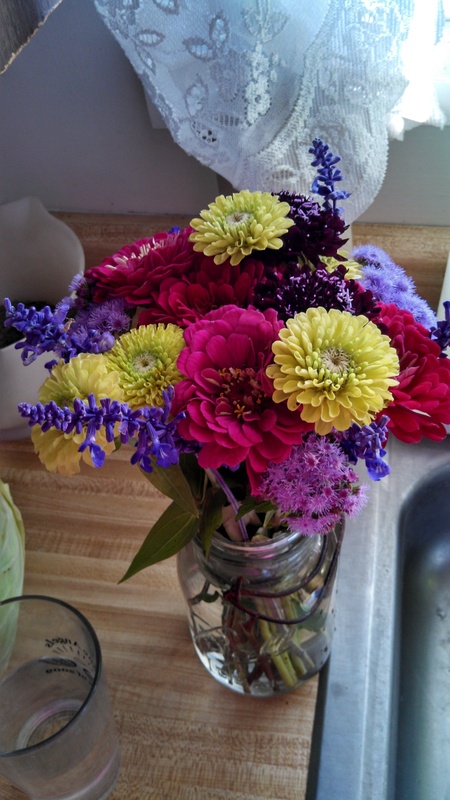 Hubby bought me some beautiful flowers from a local farm…. And we’ve been enjoying the weather. 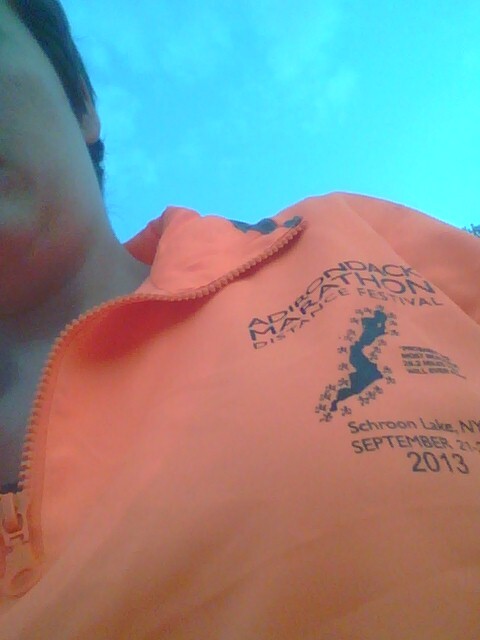 I finally got to break in my sweet orange wind-breaker from the race. 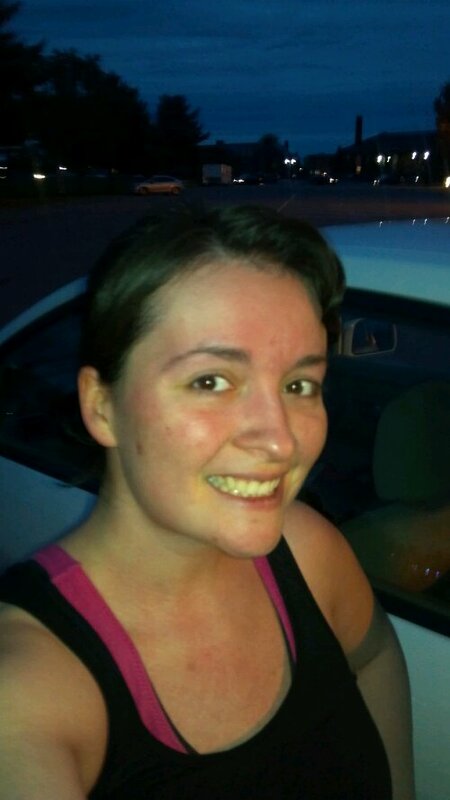 My biggest frustration at the moment is that I haven’t run since my marathon. I took a few days off for recovery and, much to my dismay, ended up having to work both jobs for the entire week following the race. Running a marathon and then working 12-15 hour days for five days is not conducive to recovery. That Saturday, I was going to go for a short run but I started having a weird pain behind my knee. It hasn’t gone away. It’s more annoying that downright painful and almost feels like a snap or a pinch…does that make any sense? It’s not my knee… but I don’t know how else to describe it. I did some google-ing and am guessing that it’s either a baker’s cyst or a meniscus but doesn’t feel painful enough to be either. I did notice that the pain was a little more annoying this past week, depending on what I am doing. Yesterday, it was pretty uncomfortable and by the end of raking it was burning. Any ides as to what this is? Super helpful, right? I did, however, finally get a full physical, for the first time in at least five years. I don’t think I’ll be returning to that doctor as, honestly, I found him a bit kooky (and that is saying a lot, coming from me), but it’s nice to know that as far as he could tell, I am perfectly healthy. Anyway, I have a friend who works for a knee specialist and she offered to get me an appointment… it sounds silly, but I am putting it off because I am convinced it’s actually nothing and will feel silly if I turn out to be right. These are the things that go through my head… sigh. Well…that’s all for now… It’s going to be a short work week and a lot of driving. I cannot wait! What have you been up to? What are your weird aches and pains? Cooky doctors-discuss. Butternut Squash, yes or no? Let’s be real, I can’t function this week. I am a hot mess. Scratch that… I am THE Hot Mess. The last 24 hours have been full of bruises, spills, and mishaps. Bang my head on a countertop and now have a lovely giant bump on my forehead. Run into a desk, leaving a nice thigh bruise. Bang my arm against a shelf, another bruise. Spill a container of ketchup. And for the grand finale? During lunch, I was opening a bottle of delicious (homemade) roasted garlic vinaigrette to pair with my giant salad… and well, instead of dressing my greens, I managed to violently spill half the bottle all over my desk, my phone, my chair, the floor (carpet) and my pants in the process. Anyway, I happened to have an extra pair of pants in my bag…otherwise, it would have been a rough rest of the day..
So… I’m rocking jeans at work….sigh. What are some of your hot mess moments? Are you having a better week than me? So… things have been a bit nuts lately. For real… This post is, for lack of a better word…a mish-mash of everything. Race planning is still going strong. We’ve gotten even more sponsors and are getting more registrations… have you signed up yet?! 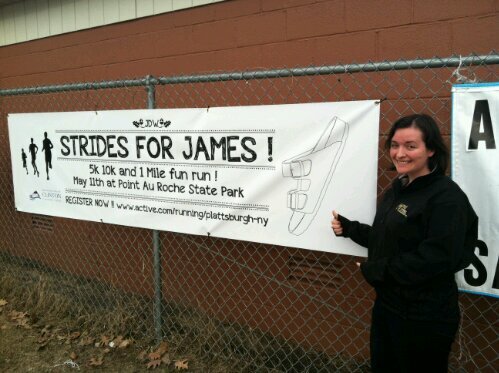 We also put up our really sweet banner. Donated by Loreman’s. Pretty sweet! Check out our Facebook page to see some really awesome prizes! I’m taking a really cool class through the University of Florida, but it’s got bonkers forum posts. Seriously…every morning I have approximately 27 new emails notifying me that someone added to a thread. I think it’s time to update my subscription settings….I just can’t keep up. Per my usual fashion, I am behind on my journal posts (whoops!) but will be catching up this weekend. The good thing is, I am getting a refresher on economics. Our home has turned into a chicken sausage test kitchen. Really delicious… but holy cow (ha ha! Get it?) , I’ve been getting so much protein lately! My body is so…confused! I’ll call it a win. Tonight, I’m making this sauce…partly because I need to use up the cauliflower that has been hanging out in the kitchen for the last week and partly because it’s delicious….and pretty good for you. I have cookies to bake for people who have been pretty awesome lately. I really want it to start getting warm outside. Why do I live in Upstate NY again? Also, why does everyone have their cranky pants on today?! Geesh! 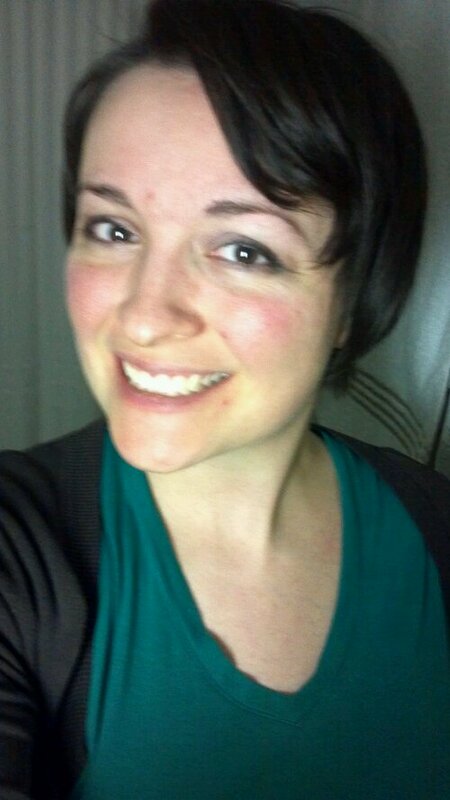 Also, I made a really awesome (slightly crazy) decision the other day and cut my hair… super short. I love it! Thank you, Lianna! How cool is that? Pretty stinkin’ cool, in my opinion. It’s also a very special lady’s birthday today. Her name is Vera. Happy birthday, Mom! I won’t tell the whole world how old you are… because I’m a lady. And so are you. I will say that you look pretty darn good for your age! Enjoy your day and here’s to the best year yet! Happy belated birthday to my dear friend Melissa-and another huge congratulations to you and Jeff on your engagement. I am so excited and happy for you both! Happy early birthday to my awesome brother-in-law, Elliot! Your card is going to be late. And so will your present. Hubby is hitting a milestone on Monday. We’ll be celebrating his day in NYC for some foodie and beer awesomeness. We cannot wait. I’ll be taking lots of pictures…as long as my phone doesn’t decide to stop working like it has been. I apologize for the brief interruption of your regularly scheduled blog posts… I’ve been really busy at work, gotten a horrible cold, caught a really bad stomach bug and had some technology issues (see above note about my phone). But I am working on some really good stuff and I have so much to fill you in on-more challenges, #elf4health, goals for next year, Christmas, food goodness, Farmer Ben’s birthday extravaganza and more! WordPress just informed me that I have been blogging for a year… And to be honest, I can’t believe it! Has it really been a year since I told you about my crazy wedding photo journey? This got me thinking… what’s changed in the last year? I’ve made peace with turning 25. Sort of. I’ve learned a lot of new things. And discovered a lot about myself and those around me. I’ve lost 28 lbs. After getting married, I gained some weight. A lot more weight than I wanted to. I started and stopped trying to lose weight a few times, and then…about 6 months ago, something clicked. I still have a few more pounds to lose, but I am feeling pretty darn good lately. I’m also in a size I haven’t worn since high school…and I am okay with that. I am back to running. Last year, I did some running…on occassion. But this year, I am a runner.… I’m doing crazy overnight races… and huge races in other states… and now I am planning more races. Some say I’ve lost my mind, but I think I am just finding it. I also joined in on some online fun. I never would have done this a year ago because I considered myself a rebel… And I still am of sorts… but now I am embracing this whole internet community thing. I dig it. I love hearing from new people and learning about them. People I love have passed… but I’m keeping their memory alive and working to do great things in their honor. Things that still haven’t changed? I still don’t like flavored yogurt. I still cook/bake with booze. I still heart my hubby. 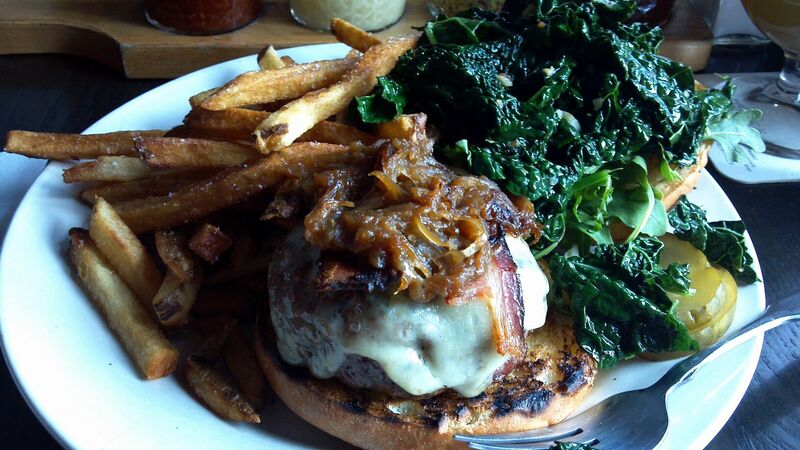 I heart local food. Obvoduh. And I am still super excited, blessed and thrilled that you’re reading…especially those of you who have been there since the beginning. Thank you for taking the time to read, comment and support me. Anyway, it’s been a pretty great year in the world of Noelle’s Notebook….and I hope for many more! Much Love. Happy Almost Turkey Day. I often make mental notes…sometimes I even write them down. Here is a look at what goes on inside my head-at least what was going on yesterday and today. 1. Check pants before putting them on, they may have a hole in them. 2. Wear black underwear if you have a hole in your black pants, it’ll help disguise this fact. 4. I think it’s time to buy some new pants. And to figure out what the heck size I wear these days. I also need heels. And shirts. 7. Run run run run run run run! 8. Iced coffee would greatly improve my day. 9. It is definitely a big sunglasses and messy bun kind of day. 10. To post the latest awkward story? Or not to post? 12. At this time last year, I was going crazy planning a wedding and working crazy hours. This year, I attended a wedding and am still working crazy hours. Life makes me smile. 13. I eat really odd things when left to my own devices. Like sardines. 14. Find tonic that isn’t full of high fructose corn syrup. 16. Finish the three two other blog posts I started. 17. Pick up items for giveaway. 18. Give Farmer Ben a big kiss. He is way too good to me. 20. I’m getting old. Falling asleep before 9 pm is ridiculous. 22. Where the heck is all my chapstick? 23. I need more cheese in my life. 24. I love Leonardo DiCaprio… and pickles. 25. Holy Cow! This is my 71st blog post! 26. The Ragnar Relay is actually happening! AH!!!! See number 7. Repeat often. 27. Good luck tomorrow Liz! You are gonna rock it!!! !